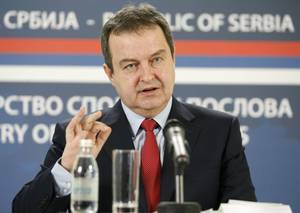 Ivica Dacic, the leader of the Serbian Socialist Party, junior partner in the ruling coalition, stated that if Serbian President Tomislav Nikolic runs for another term, up against the ruling Progressive Party’s nominee, Serbian Prime Minister Aleksandar Vucic, he would become an opponent of his own party. “Let now see what Nikolic would do without Vucic. I cannot wait to see that. Nikolic should ask himself who would vote for him – original Progressives or maybe the opposition,” Dacic stated, claiming that Vucic will certainly win the elections with or without Nikolic’s support. Several media outlets reported on Wednesday evening that Nikolic had decided to run for another term, although his party has already voted to nominate Vucic. Islamic self-radicalization increased in 2016 in Romania, with both Romanians converted to jihadist ideology and foreign citizens coming from terrorism prone regions active in the country, read an yearly report released on Thursday by Romania’s Organized Crime and Terrorism Directorate DIICOT. Out of 141 terrorism cases, however, only 36 have been solved, and only two people have been prosecuted and are currently under arrest, the same report said. The Romanian citizens who have self-radicalized have come in contact with the jihadist ideology online, and they usually deal with psychological or social issues that make them vulnerable to self-radicalization. The report also says that, even though jihadists are rare in Romania, the country could be vulnerable due to the lack of qualified specialized personnel withing the DIICOT. 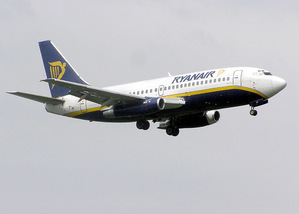 A 21 year-old Romanian suspected of terrorism was arrested at the beginning of the month on the airport in Frankfurt, Germany, as he was leaving for Romania. According to the Romanian Intelligence Service SRI he was self-radicalized and was planning attacks in Germany. Serbia’s ruling Progressive Party stated that out of its 185 party boards in local cities and municipalities, 35 have already held sessions in which it was decided to support Serbian Prime Minister Aleksandar Vucic as their party’s candidate for the upcoming presidential elections. More local Progressive Party boards are holding sessions on Thursday ahead of Friday’s main board session in which its members should officially announce their candidate for spring elections. Milos Vucevic, vice president of the Progressives’ main board, stated on Thursday that the party has never been more unified and that any attempt to bring divisions within it will fail. Vucevic alleged that all attempts to bring disunity within the Progressives’ ranks were the “attempts of interest-tycoon-mafia centres that want to regain their power over Serbia”. Vucevic’s comment came following local media reports that Serbian President Tomislav Nikolic has decided to run for another term, despite his party having voted to nominate Vucic as its presidential candidate. Regional TV N1 and Sputnik Serbia reported that Serbian President Tomislav Nikolic sent a letter to Prime Minister Aleksandar Vucic expressing his wish to become leader of the Progressives and the next prime minister, in order to support Vucic’s presidential candidacy. BIRN could not independently verify the reports. Media previously reported that in an unexpected move, Serbian President Tomislav Nikolic has decided to run for another term, although his party has already voted to nominate current Prime Minister Aleksandar Vucic. Stanislava Pak, advisor to Serbian President Tomislav Nikolic, said Nikolic expects to reach an agreement with Prime Minister Vucic “in the interest of Serbia”, adding that Nikolic does not want any divisions. According to Pak, all other solutions would be bad for Vucic, but also for the country. She added that Nikolic will issue a public statement only after talks with Vucic. Media previously reported that in an unexpected move, Serbian President Tomislav Nikolic had decided to run for another term, although his party has already voted to nominate current Prime Minister Aleksandar Vucic. In Bosnia, Almaz Nezirovic has been sentenced to two years in prison for crimes against Serb civilians in Derventa and Brod in 1992. The first instance ruling of the Court of Bosnia and Herzegovina found that former HVO military policeman Nezirovic was guilty of brutal treatment of detainees that amounted to war crimes. Around 56 per cent of the foreign tourists who visited Bulgaria in 2016, amounting to some 4.6 million people, used budget airlines, Bulgarian tourism minister Stela Baltova announced at a conference on Thursday. According to Baltova, along with the entry of low-cost flights onto the Bulgarian market, the other factor which is stimulating growth in Bulgaria’s tourist sector is its image as a safe destination. 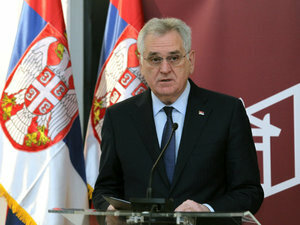 Serbian President Tomislav Nikolic said on Thursday that he is still waiting to reach a deal with Serbian Prime Minister and leader of the Progressive Party, Aleksandar Vucic, on candidacy for the upcoming presidential elections. Speaking to daily Kurir, Nikolic said: “I am still waiting for an agreement with Aleksandar Vucic. I will not make any decision before that and I will not place anyone before a fait accompli. Media previously reported that Nikolic had decided to run for another term late on Wednesday despite the fact that the leadership of the Serbian Progressive Party, which he is a member of, had already proposed Vucic as its candidate for the upcoming presidential elections. 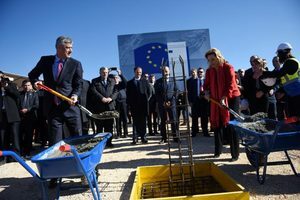 Kosovo and EU officials laid the foundation stone at the Merdare border crossing with Serbia on Thursday, marking the beginning of works on the first of six permanent crossing points in line with the Integrated Border Management, IBM, agreement signed between Kosovo and Serbia in 2011. “This way we’re not only fulfilling European standards, but we’re decreasing the informal economy. Through dialogue and cooperation, we will increasingly empower our statehood,” said the President of Kosovo, Hashim Thaci. The European Union office in Kosovo’s capital, Pristina, will spend 9.4 million euro on the construction of the permanent crossing points. Romania is to continue the fight against corruption and to implement the benchmarks of the Cooperation and Verification Mechanism (CVM) until all reforms are done, First Vice-president of the European Commission Frans Timmermans said in a joint press conference with Romanian Prime Minister Sorin Grindeanu. 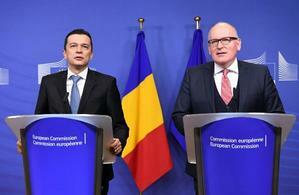 Romanian PM Sorin Grindeanu (left) and EC Vice-president Frans Timmermans. Photo: EC - Audiovisual Service. The Romanian PM is on his first official trip to Brussels on Thursday and Friday and he’s expected to discuss the latest developments in Romania, where an attempt by the government to pass legislation to relax the fight against corruption sparked the largest protests since the fall of communism as well as international criticism. “I am very much aware that the Romanian government needs to change legislation to make sure that it’s in accordance with European regulations and in that area we’ve offered our expertise to make sure that it happens as intended by the Romanian government and in line with EU legislation,” Timmermans said. He also pointed out that the EC has looked at the overcrowding of prisons and that the European executive is willing to work with the government in Bucharest on projects to improve living conditions in prisons and there is the possibility of using European funds to do that. The Romanian government has been mulling a bill to pardon certain detainees, including some sentenced for graft-related crimes. Grindeanu said he requested that some elements of the CVM should be phrased more clearly and the government will send the EC the issues that are not clear. He also said that any draft on modifying the Penal Code would have to go through public debate and the Parliament. “There should be as wide a debate as possible involving all Romanian institutions, NGO’s and the Parliament so that the decisions of the Constitutional Court concerning certain articles in the Criminal Code and the Criminal Procedure Code will be approved by the Parliament,” Grindeanu said. On Friday, Grindeanu will meet with the president of the European Council, Dibald Tusk, and the head of the European Commission, Jean-Claude Juncker. Media reports that the Serbian prime minister and president might run against each other in presidential elections could lead to public divisions within the ruling Progressive Party. Read more. Bosnia’s growing foreign arms sales are a rare export success for the country, although many weapons are going to Saudi Arabia, which has been accused of abuses in the Yemen conflict. Read more. Serbia’s banking sector is facing major changes, including mergers and takeovers, but bank clients are unlikely to feel many benefits, experts say. Read more. Low-cost Hungarian airline Wizz Air is launching a new route from Kosovo’s capital Pristina to London’s Luton airport as of June, the company announced on Thursday. The route, which will open on June 24, will be running between Kosovo and the UK’s capital twice a week, on Tuesdays and Sundays. Wizz Air announced that it was entering the Kosovo market in December, when the company stated it was launching Pristina-Budapest flights as of April. The Russian embassy in Bosnia and Herzegovina has warned that a possible appeal by Bosnia against the 2007 verdict of the Bosnia-Serbia genocide case, heard at the International Courts of Justice, could have negative consequences for stability in the region. Bosnia has until February 26 to appeal the verdict, which cleared Serbia of complicity in acts of genocide in Srebrenica in 1995. The 2007 ruling did, however, find that Serbia had failed in its duty to prevent genocide. The embassy said such an appeal did not have the support of Bosnia's three "constituent peoples", the Croats, Bosnian Muslims and Serbs. Top-level Serb officials including Republika Srpska President Milorad Dodik have recently come out to condemn any attempts to revise the 2007 verdict. 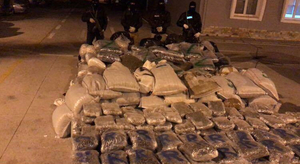 Around 700 kilograms of cannabis was seized by Greek police early on Friday morning when a truck carrying the haul across the Albania-Greece border at the Kakavije checkpoint was stopped, Albanian media have reported. According to initial media reports, the driver fled the scene when police were about to search the rear of the truck. Speaking at the Munich Security Conference on Thursday, Croatian President Kolinda Grabar Kitarovic stated that Euro-Atlantic integration is being "targeted by some countries that are illegitimately interfering” in the region. Grabar Kitarovic claimed that the lack of interest from the EU and NATO towards South-Eastern Europe has awakened old nationalist and expansionist aspirations, strengthened Islamic radicalism and led to other countries from outside of the region, such as Russia, becoming involved. “Croatia strongly supports the enlargement of the EU and NATO, but also the sovereign will of others to choose their own allies,” she said, adding that it will not tolerate other countries interfering in the internal affairs of countries in the region, specifically mentioning Montenegro. With media reports circling about a possible showdown between Serbian Prime Minister Aleksandar Vucic and President Tomislav Nikolic in upcoming presidential elections, the premier stated on Friday that he will not participate in "big fights", but noted that immense challenges and problems lay ahead for the ruling Serbian Progressive Party, which he leads, claiming that "it seems like the whole world fell on our [the Progressives’] head and that it is important to all that we lose." Asked to comment on the media reports that emerged on Wednesday evening that Nikolic intends to run for re-election, Vucic said he will always say only good and decent words about Nikolic, no matter what his potential election rival does. "I'm always ready to cooperate with him [Nikolic] and to work together before and after the elections," Vucic said after a meeting with Austrian Chancellor Christian Kern on Friday. Vucic added he doesn't want to deal with "gossips, half-truths, or even truths" and will not comment on daily political issues. The Serbian premier also said he will not decide whether he will attend the Progressive’s main board meeting on Friday evening, in which it is expected that the board will confirm Vucic’s candidacy for presidential election, until after Kern’s departure. Croatian weekly Novosti claimed on Friday that Science and Education Minister Pavo Barisic committed the act of auto-plagiarism after it conducted a comparison of his doctoral dissertation with his MA work and pre-doctoral scientific articles. According to Novosti, over 60 per cent of Barisic’s doctoral dissertation titled 'Welt und Ethos' ('World and Ethos') at the Augsburg University in Germany is compiled from his MA work and earlier articles, which is forbidden unless clearly stated in the dissertation and the accompanied written statement. The first reports of the alleged auto-plagiarism were published last week by Croatian news site Index, just before parliament held a vote of no-confidence against Barisic after the highest state ethical committee confirmed he used work by other authors in his scientific article 'Does Globalisation Threaten Democracy', without proper crediting. 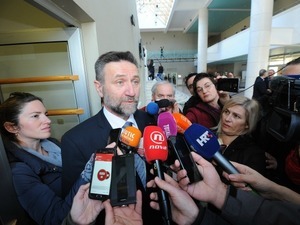 Barisic, who survived the vote, refuted the reports of his alleged auto-plagiarism, claiming that it is not illegal under Croatia’s constitution. Croatian physicist Ivan Djikic and philosopher Jure Zovko reported Barisic’s alleged plagiarism to Augsburg University, which confirmed to BIRN it had received the report and was currently “in the process of verifying the identity and credibility of the informants". Macedonia’s opposition Social Democrats, SDSM, said on Friday they are reviewing the latest proposal of a law initiated by the Democratic Union for Integration, DUI, that tackles the extended use of the Albanian language across the country. The DUI sent the proposed law to SDSM on Thursday as part of their ongoing talks on the possible formation of a new government after the December 11 elections. DUI’s support is crucial for SDSM to secure a majority in parliament, but the party demands the adoption of the so-called Albanian platform, which mainly tackles the rights of the country’s Albanians. Chairman of Bosnia's council of ministers, Denis Zvizdic, is in Munich today and this weekend for the security conference that is drawing defence and foreign ministers from across the world. Zvizdic told local media N1 there had been a special panel on NATO's approach in the Western Balkans last night. "There is more and more talk about the Balkans. The problems are not completely solved, because the Balkans are not all EU and NATO [members]," he said. The panel heard that the Western Balkans must implement reforms to improve rule of law, and that there is no security in Europe without security in the Western Balkans, according to N1. "Potential threats are always possible. No city or country in the world can say that it is protected. Terrorism is the focus of this conference, and talk about different models of effectively fighting against one of the greatest threats. No one is protected," Zvizdic said, according to N1. The European Commission and the EU member states have granted Bulgaria 920,500 euros to research opportunities for creating a gas distribution centre on the country’s territory, the Bulgarian Telegraph Agency announced on Friday. The idea for the creation of a distribution centre, also known as the Balkan gas hub, was launched by Bulgaria’s ex-prime minister Boyko Borissov in 2014, soon after Russia’s president Vladimir Putin scrapped the South Stream pipeline project. A part of the funds, for initial research, will be granted to Bulgaria’s state gas company Bulgargas, which will be in charge of the research project’s implementation.